London to the top and back in 24 hours - can it be done? Can you rent out a Boris Bike, drive across France, ride up Mont Ventoux and get back to London in 24 hours? That’s the challenge Rob Holden and his friends Matt and Ian set themselves, checking out a Boris bike in the small hours, hot-footing it to the Eurotunnel and then across France to Ventoux. On his JustGiving page, Rob said: “The ride itself was ridiculously hard. Massively over-geared for the relentlessly steep section of the climb, from 6 to 15km, by Chalet Reynard (at 15km) my whole body was in pain but I managed to fight on to the summit. Then it was time to put the bike in the van and try and get back to London before the deadline. Rob set about this bit of very English madness to raise funds for MacMillan Cancer Support, and has already exceeded his original target of £2,000. 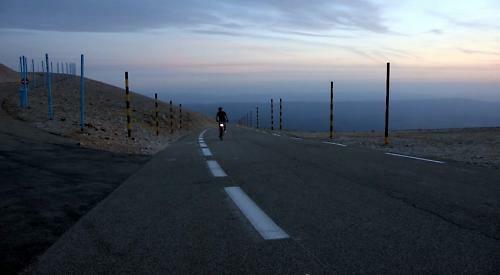 If you feel that someone who spent almost three hours toiling up Mont Ventoux on, in effect, a 23kg singlespeed deserves a donation, here's his JustGiving page.